Ok, so I'm not even pissed off that I didn't get to miss work to go to the sales conference (which happened to be in Eastbourne this year) or be provided with dinner entertainment from Michael McIntyre (totally over him, SO last year) during the evening "banquet" or rub shoulders with other C-list-celebrities-come-pseudo-authors. What I am pissed off about is missing Dawn French, (AKA The Vicar of Dibley) who also happened to be at this said event, talking about her new book that we're publishing. That hurt a little. 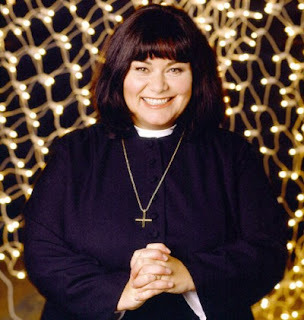 Like Jonathan Creek, The Vicar of Dibley is a British television show that holds a special place in my heart. When I was weeping into my cold plate of beans on toast for dinner back in York approximately 3 years ago because I had no friends or social life to speak of, the Vicar became my friend. Yes, I found one of those sketchy "free streaming tv shows" websites and watched episodes of The Vicar of Dibley back to back when I had trouble sleeping or missed home too much. The Vicar's hilarious interactions with her parish cheered me immensely and allowed me to wipe my tears and sniffles away. It only became sad again when I downloaded the theme song onto my iPod (which might explain why I had no friends at the time - the song has since been deleted. Ok, so I haven't deleted it but you shouldn't judge me anyway, as Howard Goodall is a musical genius). Now, I'm by no means a religious person. Spiritual, maybe, but more like Mother Nature and yoga ala Avatar (which, if you haven't seen already, OMG you totally have to!) than the Father, the Son and the Holy Spirit (if this offends you, please stop reading - don't try to convert me). But I loved the show. I loved the people of Geraldine Granger's parish, I loved her sermons, her plucky, feminist spirit and most of all, how much she and the parish made me laugh. There isn't a time when I step into a small country church and don't recall, with great affection, this lovely sitcom. So that's why I'm pissed off about missing the sales conference.